State finals for the National Geographic Bee were held across the country on April 1. Winners will compete in Washington D.C. on May 24-25. 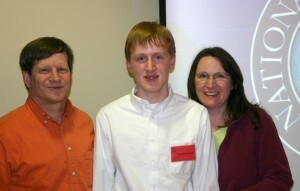 First place winner of the Virginia Finals is Patrick Hammes, shown here with his parents David and Elizabeth Hammes. Patrick is in the 7th grade at Herndon Middle School, Herndon, VA.
Good luck in Washington, Patrick! 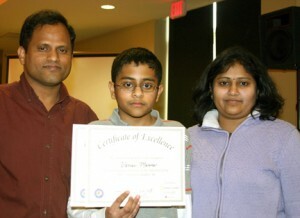 2nd Place finalist, Vamsi Manne, a 7th grader at Mercer Middle School, Aldie, VA. His proud parents are Ravi and Vara Manne. 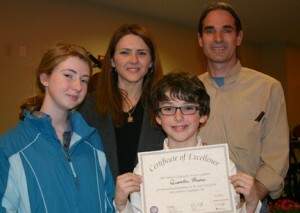 3rd place went to Quentin Powers, a 5th grader at Arlington Traditional School, Arlington, VA. He is shown with sister Vanessa, mother Evelyn, and father Stephen Powers. Calvin Hones (6th grade, Hone’s Home School, Richmond), Austin Thomas (7th grade, Blessed Sacrament Hugenot, Powhatan), Conor Crotty (8th grade, Seneca Ridge Middle School, Sterling), Michael Dimond (4th grade, St. James School, Falls Church), Peter Rohrer (7th grade, Kilmer Middle School, Vienna), Joshua So (6th grade, Forest Edge Elementary, Reston), and Patrick Steward (8th grade, Sterling Middle School, Sterling). All 105 participants are winners!